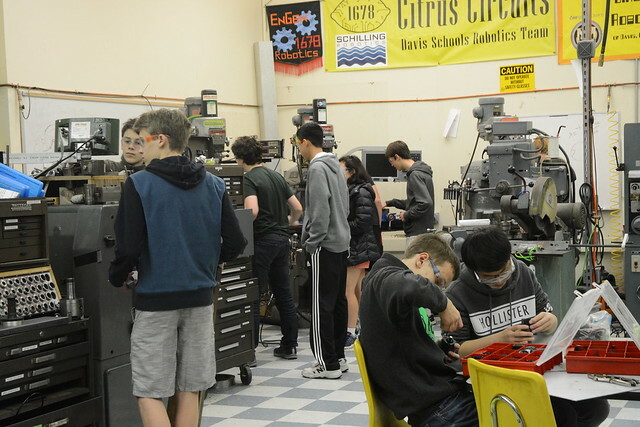 Since build season ended on Feb. 21, the Davis High Robotics team, Citrus Circuits, is working hard to finish and test its robots for upcoming competitions. Senior and team captain, Bryton Moeller, has been working hard to ensure all subteams are on track to finish. Though some subteams were a little behind, Moeller said he wasn’t concerned about it because of the experience and dedication of its members. “Our student base […] is pretty dedicated. So this week we’ve had people working after school for hours into the night, every single day,” Moeller said. Citrus Circuits mentor and parent Brook Ostrom also noted the dedication of this year’s team members, adding that more students have joined and stayed with the team this year than in previous seasons. “Everybody’s putting in an enormous amount of energy and time in getting us through build season […] I think the team is on track to really get a good robot built,” Ostrom said. Ostrom works with the business and media subteam, developing press releases and newsletters, and putting together videos and photos for the website. Ostrom has found through his years as a parent and mentor that the team has made a positive impact on many students’ lives, including his two kids, senior Kelly Ostrom and freshman Daniel Ostrom. Ostrom added that Daniel has found a passion for videography through his experience on the business and media subteam of Citrus Circuits. “It’s just something, you know, he’d never really thought about before, and so now he’s stepped into it and really enjoying it,” he said. Moeller cited robotics as the source of many skills he and his peers have learned during their time on the team. “Besides those technical skills, people are also learning leadership, they’re learning basic responsibility,” he said. Citrus Circuits is looking forward to the first competition, the Central Valley Regional, on March 11. Moeller, Ostrom, and Phimmasehn all emphasized that robotics has something to offer every student, no matter where their interests lie. Information about the robotics class offered at DHS can be found in the 2017-18 course catalog.